Dr. Gail Cheney is a 2014 graduate of the PhD Program in Leadership and Change at Antioch University. 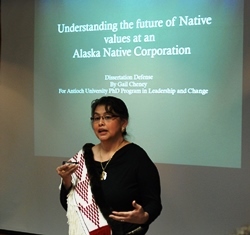 Cheney, Gail, "Understanding the Future of Native Values at an Alaska Native Corporation" (2014). Dissertations & Theses. 81.